It’s an exciting time of the year when students are back on campus. I am looking forward to introducing them to the Carson College of Business’s plans and aspirations to enhance international opportunities at Washington State University. As a newcomer to the college, I’m so impressed by the growing number of faculty committed to providing students with exciting and powerful international learning opportunities. I believe that now more than ever, it’s so important for future business professionals to have opportunities to engage with people from all backgrounds, learn a foreign language if at all possible, and develop respect for other cultures in order to gain their clients’ trust and reliance. Empowered with knowledge of diverse perspectives, our students will graduate prepared to communicate with people from a variety of backgrounds, having gained global experiences and grown in cultural understanding. They will have competitive advantages in their careers and will be able to develop strong business philosophies that will enable them to succeed in their jobs while making a greater impact in the world. 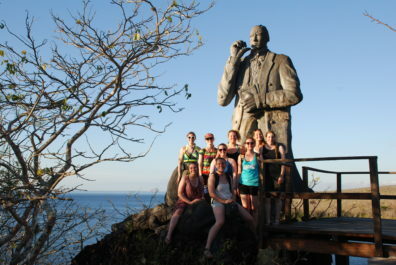 WSU students around the Charles Darwin statue in the Galápagos. One of our goals is to increase the number of students studying abroad, but cost is often a barrier. Scholarship support can be the deciding factor in whether or not a student achieves a truly global business education by being able to afford a study abroad experience. The featured testimonials by Brittany Torres and Steve Winckler in this issue attest to the transformational experiences and life-long relationships that result when students have opportunities to study internationally. International internships can also make a critical difference in students’ abilities to achieve the career of their dreams. I urge any of our alumni or industry associates to consider supporting Carson College students’ global learning experiences or possibly opening opportunities for students to have business internships abroad. Another goal is to expand the number of our offerings to other countries. I’m pleased to report the Carson College recently developed three new faculty-led study abroad programs in Ecuador, Austria/Slovenia, and Tanzania, launching in 2017. In Ecuador, I will oversee WSU students studying at the Universidad San Francisco de Quito—my second trip to this beautiful country! Florian Zach, a clinical professor of hospitality at WSU Vancouver, will lead students studying at the University of Primorska in Slovenia, and Mark Beattie, a clinical assistant professor of hospitality at WSU North Puget Sound at Everett, will lead WSU students studying at the Nelson Mandela African Institute of Technology in Arusha, Tanzania. Day trips, longer excursions into neighboring cities and countries, and service learning projects are built into our programs to help students gain language skills and discover the diverse culture and social weave of other countries. Students will also be exposed to some of the world’s most unique natural resources and sites, such as the Galápagos, Ecuadorian Cloud Forest, Quito Historic Center, Middle of the World Tour, and Otavalo. WSU students visit Quito, Ecuador. Since 2005 our undergraduate international business program has been ranked in the top 25 by U.S. News & World Report. As our international and national collaborative opportunities increase, we will strive to advance our ranking into the top 10. Expanding our study abroad programs and elevating our international ranking will help us reach another goal of making the Carson College a destination of choice for students seeking an undergraduate business education in the Pacific Northwest. 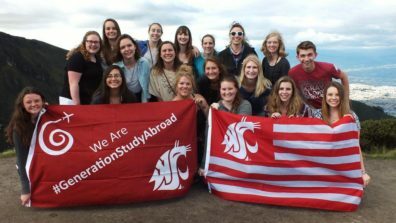 For more information on study abroad opportunities, contact Jessica Cassleman, assistant dean and director of the Carson College of Business International Business Institute, at casslema@wsu.edu or 509-335-1246. Click for more information on how you can invest in the Carson College of Business to help students develop global business perspectives, or contact Jeff Pilcher, director of development at jeff.pilcher@wsu.edu or 509-335-8906. Jessica Cassleman was the assistant dean of the WSU Honors College for the last 16 years, responsible for enrollment management, advising, teaching, and international activities. She has worked closely with international programs for over 20 years. She was a pioneer of faculty-led trips, which are a hallmark of the Carson College’s study abroad programs. She joined the Carson College in spring of 2016.